Full disclosure: This dish is not quick, but it is easy and it’s so deliciously worth the time. And it’s a meal-in-one — savory lamb, earthy greens, and tangy cheese all embraced by a double crust of flaky pastry; the only thing left to do is to pull the cork on a bottle of Syrah. My tourte is a bit of a mixed metaphor, with its roots in English shepherd’s pie, Greek moussaka, and, of course, French puff pastry, and it’s all the more exciting for its many influences. If your store doesn’t carry ground lamb, ask the butcher to grind some shoulder meat, which will have a higher fat content — and more flavor. Make the lamb filling: Heat 2 tablespoons of the olive oil in a large skillet over medium heat. Add the lamb, breaking it up with a wooden spoon so there are no big chunks. Season generously with salt and pepper and cook until no longer pink, about 5 minutes. Scoop out the lamb and set aside. Pour off any grease. Add the remaining 2 tablespoons oil, increase the heat to medium-high, add the onion, and cook, stirring, until very soft and fragrant but not browned, about 5 minutes. Add the garlic and cook for 30 seconds, then add the wine and boil until reduced to just a glaze, about 1 minute. Add the chicken broth, tomatoes and juice, and the rosemary sprig. Adjust the heat to a lively simmer and cook until it has a nice thick consistency, like marinara sauce, about 10 minutes. Take the sauce from the heat, stir in the lamb, balsamic, hot sauce, breadcrumbs, Parmesan, and sun-dried tomatoes. Taste and adjust the seasoning with more salt, vinegar, or hot sauce. Refrigerate until chilled. Make the Swiss chard: Cut away the chard stems by folding the leaves in half lengthwise and slicing along the edge of the center rib and stem. Cut the stems across into ½-inch slices. Rinse well in a colander and pat dry. Stack a few leaves, roll into a loose cylinder, and cut across into ½-inch ribbons. Repeat with all the leaves. Rinse the leaves well in a colander and shake dry. In a large skillet or Dutch oven, heat the olive oil over medium-high, add the stems, season lightly with salt, and sauté until they soften, 2 to 3 minutes. Add the leaves; if they won’t all fit into the pan, just add a few handfuls, toss with tongs until wilted, then add the rest. Cook the chard until tender, 7 to 10 minutes, then squeeze out the excess liquid by pressing them against the side of the pan and pouring off the juices. Add the butter and toss to distribute it, then sprinkle the flour over the chard and toss to blend. Add the half-and-half and cook, stirring frequently, until the greens are coated by a nice creamy sauce, 2 to 3 minutes. Season with the salt, pepper, and a pinch of nutmeg. Taste and adjust the seasoning. Stir in the egg. Assemble the pie: On a lightly floured counter, roll one sheet of pastry into a 12-inch square and transfer to a 9-inch pie pan. Trim the pastry to the edge of the rim of the pan. Spread the cooled lamb filling evenly in the bottom, spread half the feta over the lamb, spread an even layer of the chard on the feta, and finish with the rest of the feta. Roll the second sheet of pastry to a 10-inch square and cut a 10-inch circle (using a plate or pot lid as a template). Lay the circle on top of the pie, pinch the edges to seal, and crimp to make a neat edge. Chill the pie for about 15 minutes. Heat the oven to 400 degrees. Cut five small slits in a spoke pattern in the center of the pie to release steam. Bake in the hot oven until the pastry has puffed slightly and is nicely golden brown and the filling is hot, 30 to 40 minutes. Let the pie rest for 15 to 30 minutes before cutting and serving. 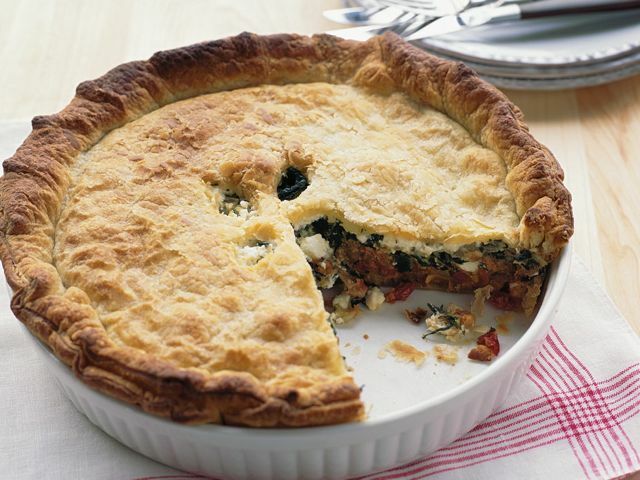 You can make both the meat filling and the Swiss chard up to one day ahead, but don’t add the egg to the chard until ready to assemble the pie. If your fillings are cold, increase the baking time by a few minutes to be sure everything is hot and the pastry is cooked. Reheat any leftovers on a baking sheet in a 375-degree oven until the filling is hot, 10 to 15 minutes.